Easy and quick cheesy bread buns ready in 30 minutes. These have been all the rage at every convention I have gone for the past year. They smell marvelous and are immediately snapped and devoured on the spot. But, do I really want to pay that much for them? Knowing me the answer is uhhhhâ€¦.no way ! So hereâ€™s the gluten free bread recipe of those yummy little morsels that would be perfect for any party, with soup or just to eat because theyâ€™re there. Do we really need a reason? In a medium saucepan, place the butter, water, milk and salt and heat to a full boil (bubbles that keep coming no matter how much you stir). Have your 2 cups of tapioca flour in a large mixing at the ready. Pour the boiling mixture right over the top of the flour and start beating with an electric mixer. Beat on high until it becomes very smooth. This happens fast. Then beat in the garlic and cheese. Now, check to see how hot the dough is. Stick your finger in there. If you can comfortable touch it without burning yourself (baby formula temp I call it) then youâ€™re ready for the next step. Keep your mixer going and slowly pour in the beaten eggs until everything is well combined. Drop the mixture using a large cookie scoop (or make sure itâ€™s golf ball size) and space them 1 Â½â€ to 2â€ apart on the parchment. Bake for 20 minutes, until they have freckles (the cheese browning here) and just turning brown. Take out of the oven and serve hot. Makes 18 to 20 buns. These reheat really well in your microwave. Just pop them in for 5 seconds at a time until hot. Full of mouth watering recipes that are easy to make. Gluten Free Stuffing: 4 ways! Can you use Namaste flour instead of Tapioca flour? You really need to use the tapioca flour in this recipe. Regular type gluten free flour makes the buns too heavy. Is it possible to use plain gluten free flour or do you need to use the tapioca flour for the good taste? Thank you. 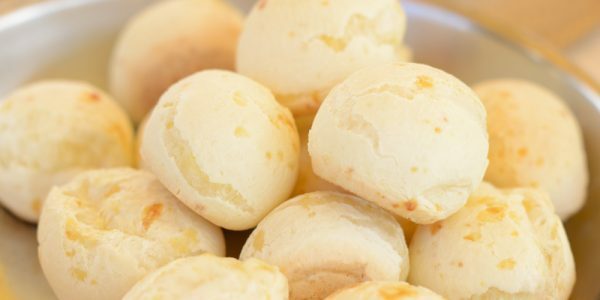 The tapioca flour is what makes these cheese buns what they are. If you use gluten free flour ( most are rice based) these cheese buns will not be as light and airy. I’m sure they will taste great, just won’t be the same texture.